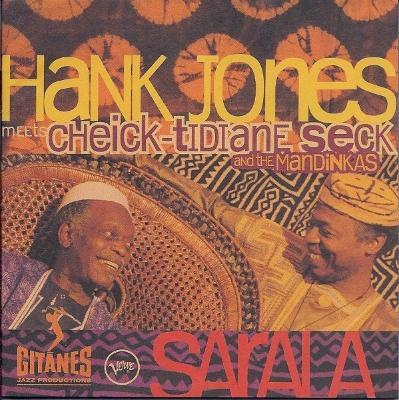 And then of course, that takes me to his [Salif Keita's] brother, Cheick-Tidiane. Anytime Cheick-Tidiane and I get together we are always saying we had better do something together. We are alive. We are well. You have done it with your American brother. And now you need to do it with your West African brother before it is too late! And we are always saying that. We have met onstage together many times, but I think this particular album they did, Sarala, was one of my favourites. When I did the Essential Afrobeat compilation, I selected from this album too, but it didn't make the final selection. When I heard about this album, I was like, woah, fantastic, let me check it out. When I heard what they did I thought, woah, now it's my turn, me and Cheick have got to do something. In terms of quality of the composition, [there's] the way it touches, the way it takes on the Afrobeat idiom. That's the flute caller that calls in the instrumentation and then the nice, rich piano of Hank Jones, and the organ playing of Cheick-Tidiane, talking together, whispering, cajoling, calling, encouraging, you know? It's great. And it just inspires me. It helps when I get to a stage when I need to clear my head for my own mishmash of cacophony, I just listen to this. You hear the piano, then you hear the organ of Cheick on this side and it reminds me of my language, Yoruba. It's like they are speaking Yoruba, but it's completely different from my language. It just reminds me how we have a lot in common, but we also don't have a lot in common. And it's about time we try and embrace each other and do something together. When I get that longing, it's about time I do something with these guys and I've got to bring this out. That was a seminal thing that they did. Sadly, they didn't follow it up.